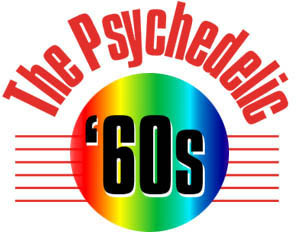 THE ONGOING AND escalating war in Vietnam was the focus of many of the major protests during the sixties. At the time of the assassination of President John F. Kennedy, United States military forces in Vietnam numbered less than 15,000. Under President Lyndon Johnson the numbers grew dramatically, and by 1966 more than 500,000 troops were deployed in the area. Media reports from overseas became increasingly gruesome, and television transmissions showed the death and destruction created by the relentless bombing campaigns of U.S. forces. The nightly news reports counted the dead, and many major literary and political figures began to speak out openly against keeping U.S. troops in Vietnam. Escalation had not achieved the promised results. On January 30, 1968, the North Vietnam army overran Saigon, making a daring predawn attack on the United States Embassy. On November 30, 1969, newspapers reported that U.S. Army troops had massacred up to six hundred men, women, and children in a remote village called My Lai. Opposition to the war grew from many quarters, as the nation began to take a hard look at the United States' involvement in Vietnam. Joseph Heller. Catch-22. New York: Simon and Schuster, 1961. ALTHOUGH WRITTEN ABOUT World War II, during the sixties, Catch-22 was perhaps the novel that best embodied the anti-war sentiments of the counterculture. 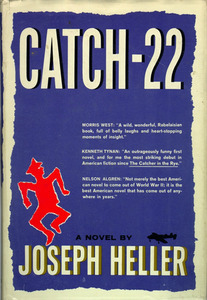 A dark, bitter satire, Heller's title has become a common catch-phrase indicating an unwinnable situation and a choice between two impossibilities. Wildly popular during the sixties, Catch-22 focused attention on the cruel absurdities of war, and news reports coming in from Vietnam only served to validate the surrealistic contentions of the author. Cecil Woolf and John Bagguley, ed. 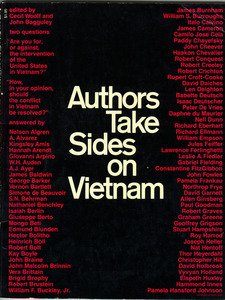 Authors Take Sides on Vietnam. New York: Simon and Schuster, 1967. BY 1967 THE debate concerning the United States' involvement in Vietnam was growing almost as fast as the escalation of forces there. This book asks two questions: "Are you for, or against, the intervention of the United States in Vietnam?" and "How, in your opinion, should the conflict be resolved?" The respondents, 168 well known authors, are from a number of countries throughout the world. Walter Lowenfels, ed. Where Is Vietnam? New York: Doubleday & Co. Inc., 1967. 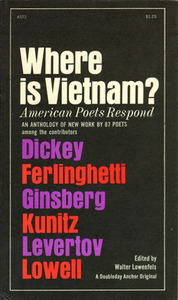 NINETY-TWO POETS and 92 poems are included, all written about the war in Vietnam. Guide to Conscientious Objection. Chicago: Students for a Democratic Society, 1966. THOUSANDS OF YOUNG men were being drafted into service for the Vietnam War each year and many did not want to go. Some fled to Canada where refuge was offered, others like Muhammad Ali served a prison sentence. Still others opted for conscientious objector status, whereby they would forego military service on moral grounds, serving instead a fixed term of community service. 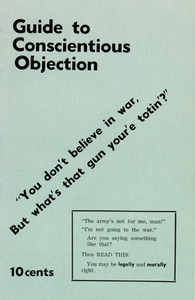 This guide issued by the SDS explains how to obtain conscientious objector status with the Selective Service Bureau. Tuli Kupferberg and Robert Bashlow. 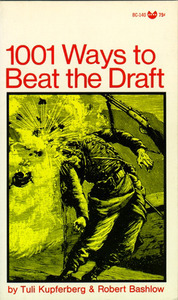 1001 Ways to Beat the Draft. New York: Grove Press, 1967. TULI KUPFERBERG, LEAD singer for the rock group The Fugs offers humorous tips on ways to avoid the draft. "Ask what's in it for you," "Marry your sister," "Cut off your left leg," are a few of the suggestions offered within.